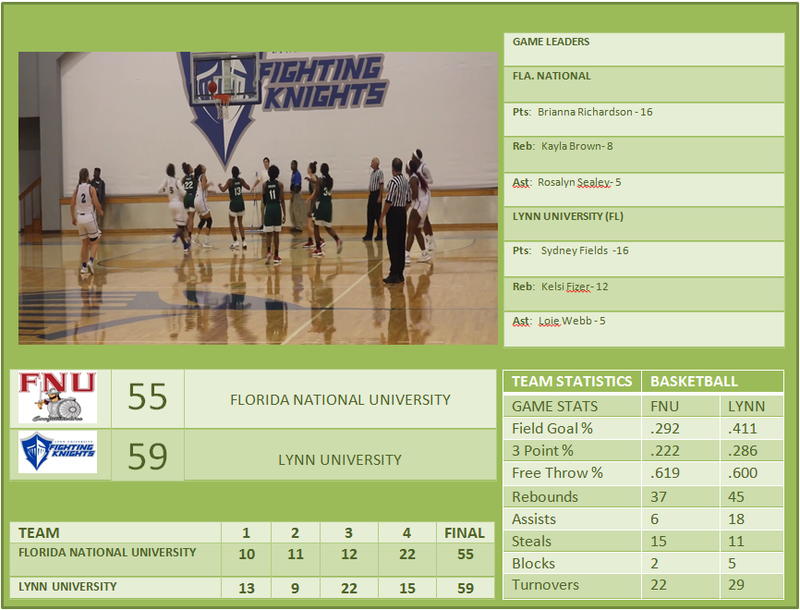 BOCA RATON, Fla. – Florida National University women’s basketball team defeated by Lynn University on Friday night as the Fighting Knights battled through a sloppy first half to outlast Florida National University, 59-55. Brianna Richardson notched a 16 points, 3 rebounds and 2 steals. Kayla Brown got 8 rebounds. Rosalyn Sealey scored 13 points and got 4 rebounds. Ashley Williams Scored 11 points and and filled out the stat sheet with 6 rebounds and 3 steals. Destiny Lindsey collected 9 points on 3-10 shooting and 6 rebounds. FNU has played 10 more games than Lynn so far this season. 11 players saw at least five minutes of action for the Conquistadors. The Fighting Knights outrebounded Florida National 45-37 in the contest. The game was the first-ever meeting between the two programs. The Conquistadors will face Johnson and Wales University on Tuesday, November 20th, at Hialeah with a tip-off of 4:00 p.m.